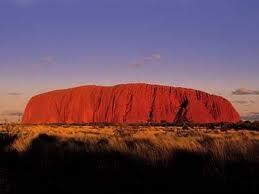 It is the natural monolithic which is called the Holy Land of Aborigine in Australia. There is a hole on the top and there are lots of giant rocks around it　in an off hand manner. I have raised the theory at an early stage that it can prove the presence of Stone gods because that hole was dug by a giant when Stone god was still soft and the things which were dug out from the hole became the rocks. How was the giant hole dug has not been proved until now by science. (According to one theory, the rock was broken as Aborigine burned a fire and the crevice got bigger. However the hole is too big and it has become the wood. Therefore I can't agree with the theory which was presented by science at all. I was told it is the rock by which the elder of Sagittarius taught how to make high waves. I was also told the elder conveyed to the prince, and princess of Sagittarius, named Munoia and Yunoia that they can go to see the queen of Sagittarius in Japan if they raise such high waves. It is the model of Wave Rock in Australia. It is the top of Wave Rock in Australia. Please think Stone god picked out the center of a rice cake. One part of the picked out portion seems to have got hard into the giant rocks. I think there was a considerably very deep holes as trees grew in the center of the rock which exists in the dry district. I was told that it was the elder of Sagittarius who made the pool on his body for the mankind and formed the shape of a wave on one side of Ayers Rock. The princess of Sagittarius descended to me at the night of March 26, 2002 when I had arrived at Perth in Australia. Please refer to the following web page for names of princess of Sagittarius. "Do something for the humanity whom we made newly without crying for a long time." was told to me by the queen in Japan through the telepathy. The queen told me humanity need water for living. Therefore I made the river at first. Next she told me humanity need fruits. Therefore I asked how to make them to the beings from the stars. The flat seeds of fruits expressed the shape of the star of Sagittarius." I found there are really lots of mysterious rocks in Australia which have not be known to many people. Those are not only Pinnacles and Wave Rock but also the rock like the fingers , the round rock which looks like the standing egg, the giant caves which look they were made artificially no matter how you look at them. There have remained the clear traces of the fingers of the giant on them. I was told caves were made so that Aborigines would live in them. However the sad feeling of Stone god was transmitted to me when I heard the sad story which seems to have been made as Aborigines were ruled by the Ruler's Stars in later years. Pinnacles is called the grave markers in the wilderness. When we go ahead the land of Australia, the desert area in which various shaped stone columns are mushrooming shows up in the bush suddenly. I was told those stone columns were made by Stone gods in order to show the stars in the universe. Those stone columns have lots of shapes but it was a little regretful most of the traces of the fingers of Stone gods has weathered away owing to the process of weathering. However I thought the stone column which I glanced at from the bus had the trace of the fingers of a giant. To the opposite, I thought there was a value in visiting Wave Rock（the giant rock shaped the wave）even if it took me 12 hours to go there. I have thought Wave Rock is the independent rock when I saw the picture of it first, but I found it is one side of Ayers Rock later. I was informed previously that Munoia and Yunoia were told to visit Japan where the queen of Sagittarius stays, in this shape（the shape of typhoon） . The top of the rock is gently-sloping and it was easy for me to climb it up. They say there used to be a big hole in the center of the megalith in the past. The rainwater was collected in it and they say Aborigines came there to scoop rainwater. A lot of trees grew in the trace of the hole and there were groups of mysterious rocks beside it. Those mysterious rocks looked as if the body of Stone god was hollowed out and they were put beside of the hollowed hole. I was told the giant crag was Stone god of the elder of the Sagittarius. Stone gods devised the human hand and they made humanity put the handprints in the caves. I was told Stone gods made the finger-shaped rocks and flowers like the handprints. The reason why humanity have five fingers is that five show four limbs and one body. When Caucasian visited there, I was told there were too many black birds which looked as if they filled all the surface of the Swan river flowing through the city. Though the feather of black birds are black outside, the inside of them are white. The beaks of them red. I asked the beings from the stars the reason of the colors of those birds. The beings from the stars taught me the birds were made into black ones because Aborigines came out of the stomach of Stone gods too early and they became black as they got scorched. 1） At night on March 22, I was aroused suddenly. Lots of men, soldiers and tanks are drawn in the big clear circle and they go ahead. 2）There is the shape of boomerang and it is separated in the center. An elephant is drawn on one of the separated boomerang and a bear is drawn on the other one. 3） The picture of a koala, a kangaroo and an emu is seen. Though the head （brain）of a koala is big, it sleeps twenty hours. It does not do anything but eating the leaves which the earth gave. It expresses the rich mankind(?). An emu is very useful (helpful) for human to the opposite as it turns into emu oil though it has the small head(brain). A kangaroo expresses it holds its ground and bring up the baby in its stomach. It expresses Stone gods descended to the earth with the mankind in their stomach. I was told kangaroos rush into the light(light of cars)expresses they make a mistake as they want to see Stone gods who descended to the earth like a fireball. 【The images of THE UNIVERSE(THE SKY)＝SORA】|　Uluru with the closed eyes and eyebrows?｜the code of Uluru?｜The platypus?｜The body of the giant who made Pinnacles?